Kohli scored 610 runs in 5 innings against Sri Lanka. Following a record-breaking Test series against Sri Lanka, India skipper Virat Kohli has moved up three places to clinch the second spot in ICC’s latest Test rankings for batsmen. The 29-year-old recorded his career-best score (243) in the just-concluded third and final Test against Sri Lanka at his home ground, Kotla and thus ended the series with a mammoth tally of 610 runs. 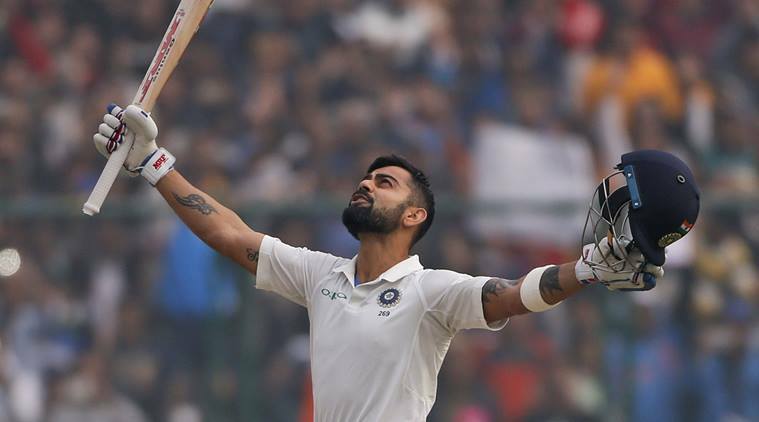 After scoring his 18th Test ton (104* off 119 balls) in the first Test against Sri Lanka at Eden Gardens, Kohli jumped up to the 5th spot in the Test batsmen rankings. However, in the next two Test matches at Nagpur and Delhi, Virat slammed two consecutive double tons and thereby leapfrogged Cheteshwar Pujara, Kane Williamson and Joe Root to reach the second position in ICC Test batting rankings, only behind Australia captain Steve Smith. Smith is leading the table with 938 rating points followed by Virat (893), Root (879), Pujara (873), and Williamson (865) as other 4 in the top 5. Though 45 points separate Kohli from Smith, the Indian captain would be eyeing the chance of claiming the numero uno tag as a batsman in all three formats since he is the current No. 1 in ODIs and T20Is. Smith though has been in a different league and last week reached 941 points, the joint fifth-highest in terms of the highest points tally in batting history in Tests and currently rejoicing a considerable lead over everyone as a batsman. However, the competition for second to fifth positions remains intense. Before this Test, only 11 points separated second-ranked Pujara from fifth-ranked Kohli. Following the latest performances, the gap has increased slightly with 28 points now separating second-ranked Kohli from fifth-ranked Williamson. As far as the Test bowling list is concerned – England pacer James Anderson leads the chart with 732 rating points 894 rating points while Proteas speedster Kagiso Rabada (876) and Indian spinner Ravindra Jadeja (870) are slotted at number 2 and 3 position respectively. Ravichandran Ashwin (829) and Rangana Herath (799) are the other two spinners who are placed in the top 5 of ICC’s latest Test rankings for bowlers.